Damage caused by an explosion at the East Ohio Gas Company's #2 Works, Liquefaction Storage Facility in Cleveland, Ohio on October 20, 1944. The explosion, caused by a gas leak, sparked fires that burned 160 acres of businesses and neighborhoods in Cleveland. Over 100 people were killed. On October 20, 1944, a natural gas storage tank at the East Ohio Gas Co. plant in Cleveland, Ohio, exploded. The plant was located north of St. Clair Avenue near East 61st and East 62nd Streets. 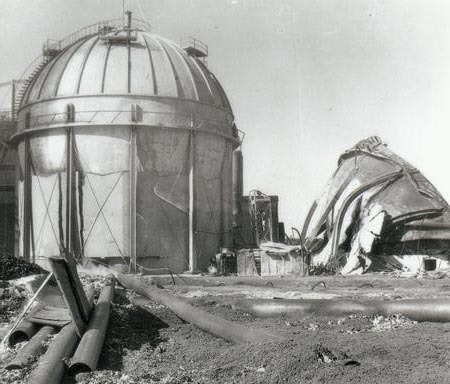 Although investigators never discovered a cause for the explosion, witnesses stated that a leak in one of the tanks occurred. Some spark must have then ignited the gas, although, with World War II currently raging, some residents initially suspected a German saboteur. This was one of the worst disasters in Cleveland's history, with 131 people killed. Twenty-one of the victims were never identified. The explosion occurred at 2:40 PM on a Friday afternoon. The death toll may have been even higher if schools were not still in session, keeping many children away from the heart of the explosion. Numerous homes and businesses were entirely destroyed over several city blocks. To store more natural gas in the tanks, the East Ohio Gas Co. had liquefied the gas. The liquid gas seeped into the city's sewer system, causing manhole covers to explode into the air and creating a fireball underground that ignited numerous homes and businesses. The fireball supposedly was more than three thousand degrees Fahrenheit in temperature. Soon other storage tanks at the East Ohio Gas Co. exploded. Cleveland residents could see the resulting fireballs from at least seven miles away and the smoke from an even greater distance. As the tanks ignited, windows broke more than one mile away, and the bells of St. Vitus Church began to ring. Almost one-half of the victims, including the unidentified ones, were buried in Highland Park Cemetery in Cleveland. For the people who survived, most lost everything. The flames destroyed several blocks of homes. Many of these people also had withdrawn their savings from banks during the Great Depression, as numerous banks had failed. The flames destroyed these people's life savings. As a result of the explosions, the East Ohio Gas Co. began to store its natural gas underground. The company also helped rebuild the community by paying more than three million dollars to neighborhood residents and an additional one-half million dollars to the families of the fifty-five company workers who lost their lives.